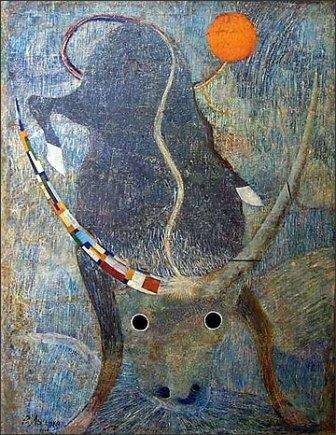 When a commission of Communist party officials, inspecting the museum in Nukus some 40 years ago, saw Yevgeny Lysenko’s painting “The Bull” (“Fascism is Advancing”) they demanded it be taken down immediately. The picture, the party bosses said, was anti-Soviet and therefore could not be exhibited. As was often the case, the officials’ intuition was correct: it is not entirely clear what political system the painter was referring to when he painted this work in about 1930. The museum’s director and founder, Igor Savitsky, obeyed the officials’ order, but replaced the extraordinary, beautiful and powerful picture on the wall as soon as they had left. Inspectors in Nukus were rare. Nukus is the capital of Karakalpakstan, formerly an autonomous republic within the Uzbek Soviet Socialist Republic of the USSR. It lies in a desert and its very remoteness helped it preserve a hiding place for thousands of artworks, including an enormous collection of works by the Russian avant-garde. This hiding place, however, was in the open. It was called The Karakalpak State Museum of Art, but its director lived his life in fear of arrest, because some of the things he did, had they been discovered, would have been totally unacceptable. It is hard to believe, but once he managed to get official funding to buy a series of drawings of a Soviet labour camp, done from life by the painter Nadezhda Borovaya, who had been a prisoner there. Savitsky persuaded his bosses that what they saw in the drawings were Nazi concentration camps. The paradoxes of Soviet life, usually so difficult to explain to outsiders, are brilliantly exposed by the authors of the film “The Desert of Forbidden Art”. With the help of archive footage and photographs, the film-makers show the devastating influence of the Soviet regime on everything that was alive – nature, art and people. The incompetence of Soviet irrigation projects produced one of the world’s worst ecological disasters, the shrinking of the Aral Sea, a huge lake on Karakalpakstan’s border. Then Nukus became home to a centre for research into bacteriological and chemical weapons, moved by a secret government order to Uzbekistan from the Urals. The capital of the autonomous republic became a closed city and one of the islands in the Aral Sea was turned into a testing area for these dangerous weapons. "Savitsky died in 1984 – just a year before Gorbachev started dismantling the old Soviet system. By that time he had 82,000 items in his museum, more than half of which (44,000) were works by Avant-garde painters." If the consequences for the environment were disastrous, for art they were no better. Of the many avant-garde painters who came to Uzbekistan in the 1920s in search of bright colour, new, exotic settings and what seemed an exciting revolutionary transformation, some were arrested in the 1930s and died or spent years imprisoned in the GULAG. Others learned to go through the motions of official “socialist realism”, yet others gave up painting altogether. At a time when it was difficult enough for people just to stay alive, not many bothered about the development of art and the survival of paintings. And yet in the desert of that inhuman regime some individuals managed to resist and even fight back. Igor Savitsky (1915 -1984), born into a wealthy and cultured family, had to conceal his origins and his interest in art. As a young man he trained as an electrician just to survive in a proletarian state. Later, his secret ambitions as a painter were frustrated by severe criticism from an artist he admired, Robert Falk, and he turned all his remarkable taste and understanding of art towards collecting. He first went to Karakalpakstan in the 1950s as artist to the archaeological excavations of the ancient city of Khorezm. He fell in love with the place and moved there from Moscow, never to return. He started collecting Karakalpak folk and applied art and bought extraordinary treasures in the nearby villages. Later he turned to collecting the forbidden art of the avant-garde, created by artists who worked in Central Asia. He made many trips to Moscow and Leningrad to look for dusty canvases by long dead painters in the homes of their relatives and bring them back to Nukus. The people who talk about Savitsky in the film are unanimous: collecting was his life. He lived in the museum, had no family, and, apart from one suit which he wore when dealing with officials, he owned nothing at all. He single-handedly and single-mindedly attempted to retrieve the art and the names of artists that had been deliberately obliterated from the country’s art and history. The dedication which characterised his life finally brought about his death: for many years he cleaned his valuable bronze exhibits by boiling them in formalin, which finally, as his doctor says in the film, burned his lungs to shreds. 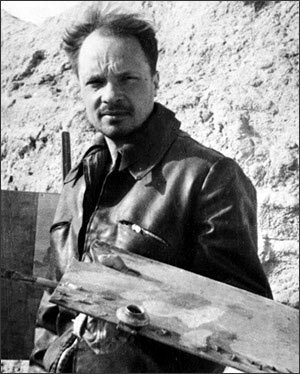 Savitsky succeeded in having a museum for his collections opened in Nukus in 1966 and even in securing funding for it. How did he do it? One of the most striking episodes in the film is an interview with former First Secretary of the Karakalpak District Party Committee, Kalibek Kamalov, who supported Savitsky in his wish to preserve the region’s art. The token multiculturalism of the Soviet empire quite often concealed brutal suppression of national cultures and again it was up to individuals to do what they could. Kamalov took on himself the responsibility of establishing a museum and funding it without asking the permission of the higher, Uzbek, authorities, eventually succeeding in making his small republic famous world-wide for its collections. It does not matter that he might not have particularly wished to preserve the heritage of “enemies of the people” and their “formalist” art. What matters is that here was an individual, like Savitsky himself, who dared to act independently of the regime. In fact many of the interviews in the documentary reaffirm an important point about Soviet history: each person’s relationship with the system was different. The children of some of the artists whose works have been brought together in Nukus, now in their 70s and 80s themselves, talk in the film about their parents’ work, their suffering and disappointments and their deaths. "Marinika Babanazarova is determined to preserve the museum in its entirety, as a monument not just to the art collected there, but to the human perseverance of her teacher, Igor Savitsky." The sons of Alexander Volkov (1886-1957), one of the major painters in Savitsky’s collection, who was prosecuted for “formalism” in the 1930s and for ”cosmopolitanism” in 1949, learn about evidence given under pressure by their father against fellow artist Mikhail Kurzin. Kurzin (1888 -1957), whose charges, apart from “formalism”, included shouting anti-Stalin slogans when drunk, was arrested twice, in 1936 and in 1948, and spent 18 years altogether in the GULAG. 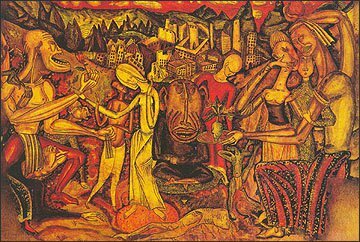 The fate of the Uzbek artist Ural Tansykbayev (1904-1974) was also tragic, but in a different way. The favourite pupil of Alexander Volkov, he betrayed his teacher when “formalism” came under fire, renounced his own extraordinary, beautiful paintings and followed the official line until his death. It was of course Igor Savitsky who managed to cajole this officially recognised Soviet painter into giving his early works to the museum. Towards the end of his life Tansykbayev decided to go to Nukus to see his old renounced self, but became so nervous on the way that he had a heart attack in the car and died before reaching his destination. It was therefore bitterly disappointing and upsetting that the very important human and historical aspects of the film seemed to be completely wasted on some of the critics who took part in the discussion after its screening at the London International Documentary Film Festival (LIDF) at the end of May. Looking at the story from a narrow aesthetic point of view, they complained about the film’s “clichéd” approach to Soviet history and accused its makers of romanticising the story. Interestingly, some Russian critics also saw the film as “overloaded with Stalin”, although they conceded that it could have been worse, had it been made by those Russians who like “ bashing their own history”. But what makes it particularly sad is that this desire to strip events of their historical and political context, which is to be found both in Russia and in Britain, more often than not leads to a misunderstanding not only of the past, but also of the present. Savitsky died in 1984 – just a year before Gorbachev started dismantling the old Soviet system. By that time he had 82,000 items in his museum, more than half of which (44,000) were works by Avant-garde painters. He was succeeded as museum director by his pupil, Marinika Babanazarova, a granddaughter of the first President of Karakalpakstan, who has been zealously trying to preserve the museum for future generations ever since. Initially several exhibitions were held across the former USSR and in France and Germany. Then in 1991, when the Soviet Union collapsed and Nukus was opened up to foreigners, visitors began to come from abroad. Many were attracted by a huge article in The New York Times, written by Stephen Kinzer, the paper’s former Bureau Chief in Central Asia. In the film he recollects his first visit to Nukus: “It did not take more than a few minutes of walking around this museum for my jaw to drop”. Art lovers and institutions in America and Europe were fascinated by the discovery of a hidden chapter in art history and eager to help the museum. And yet twenty years later, the fate of the collections is still unclear. The paradoxes of the imperial world have now given way to those of the post-imperial one - a large part of Savitsky’s collection is the art of ethnic Russians, which is not necessarily welcomed by everybody in Tashkent. The potentially growing influence of Islamic fundamentalism, is, in the words of Stephen Kinzer, “a little bit disturbing”, given that this is “ a collection of art that is abstract, modernistic and run by a woman”. But most importantly of all, the authorities in Uzbekistan want to keep the museum under control. They are, of course, flattered by all the attention it has attracted and enjoy basking in its glory. At the same time they feel they are entitled to decide its fate without consulting experts, in particular its director Babanazarova, whose independent contacts with foreigners no doubt annoy them. The film does not dwell on this, but the recent New York Times article describes the difficulties the museum has experienced recently. "With the help of archive footage and photographs, the film-makers show the devastating influence of the Soviet regime on everything that was alive – nature, art and people." All this is exacerbated by yet another contemporary paradox - the interest in, and attention to, the collections have naturally raised their market value. The museum is in desperate need of money - only 3% of the collection is on display, the rest is in storage awaiting restoration. A new building to house the exhibits is badly needed and staff salaries are very low, but so far Marinika Babanazarova has refused to sell a single painting. The Director is convinced that once the process of selling starts, it won’t stop, and who can guarantee that the money will go towards the needs of the museum rather than into the pockets of the officials? Besides, Marinika Babanazarova is determined to preserve the museum in its entirety, as a monument not just to the art collected there, but to the human perseverance of her teacher, Igor Savitsky. Babanazarova is helped by an international NGO, “Friends of Nukus Museum”. The authors of the film “The Desert of Forbidden Art” have done their utmost to increase support for her efforts. “The Desert of Forbidden Art” is an American-Russian-Uzbek documentary (dir. Amanda Pope and Tchavdar Georgiev). It was shown recently at the London International Documentary Film Festival.